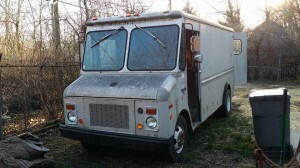 Last night I went out and bought a 1979 Grumman Olson GMC 30 Step Van for the studio. She has a new transmission, an engine with less that 5,000 miles. She needs a little love and tenderness but still has many good years of service ahead of her. The drive home was a little dicey at times. There is about 8″ of play in the steering and the breaks are really spongy. Beyond that, I had not driven a 4 speed manual since I was 18 (That was over 20 years ago). All in all, I am happy with the purchase and will be working on this old girl for most of the summer. Some thing that need work; This will get me a good start. Once I get done with her, she will be a mobile office, camper and wet plate dark room. She will also be key in moving us to Portland, Oregon. The one thing I wanted, that was not met by this vehicle, is a diesel engine. I am not going to cry too much over that. For now, I must go get some coffee and finish waking up.